Like many Zimbabweans, Esau Makwindi is frustrated over the liquidity crisis that has made it near-impossible for ordinary people to get cash in the Southern African nation. The resignation of President Robert Mugabe last week has ushered in limitless hope in Zimbabwe, especially among people like Makwindi, a 19-year-old divinity student at the University of Zimbabwe. Zimbabwe abandoned its own currency in 2009 amid hyperinflation that reached an annual rate of 231 million percent. Since then, the country has relied on foreign currency, in particular U.S. dollars and South African rand. But for more than a year, even that money has been scarce, making it hard for Zimbabweans to purchase the most basic necessities. In his inaugural address, President Emmerson Mnangagwa promised that Zimbabweans would soon be able to access their earnings. Those are words that soothe Makwindi, who wheels around his campus in a rickety wheelchair after a car crash took both of his legs last year. His savings, all $1,650 of it, sit in his bank account. But the vendor he wired that amount to can’t get the cash out to buy him what he so badly needs. VOA spoke to dozens of Zimbabweans on the streets of the capital, Harare, in the days after Mugabe’s resignation and Mnangagwa’s inauguration. Every Zimbabwean we spoke to said their biggest, most urgent concern is getting cash. Professor Albert Makochekanwa is the chair of the economics department at the University of Zimbabwe. He says, he thinks Mnangagwa has taken positive steps to address the cash crisis, including announcing a three-month amnesty for top officials to return stolen government money, and working to make it easier to import goods. But when will the crisis resolve? He wouldn’t hazard a firm guess. 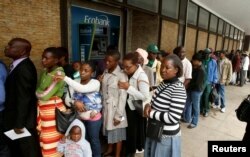 People queue to withdraw cash outside a bank in Harare, Zimbabwe, Nov. 28, 2017. That may be cold comfort for Choice Zhuwao, who stood outside a bank in central Harare for the second day in a row seeking to withdraw $50, that’s the daily maximum banks will give. If he doesn’t get it, he said, his three children will be suspended from school for a month. Jonathan, a security guard, said he had come two days in a row seeking cash. And what if he fails again? He said he’d take more, unpaid, time off work. “I’ll talk to the superiors and ask for the time to go to come to the bank,” he said, his smile fading. Cash is available on the black market, at sky-high rates, and Zimbabweans complain their only legitimate money source is more expensive. Businesses often charge higher rates for customers paying with cards or with the popular “EcoCash” mobile money application. Clothing vendor Tracy Majoni says the fees attached to these money services are making her business run at a loss. “If I want to get $100, cash, out of my EcoCash account, I am charged about three dollars,” she said. Makochekanwa says that may take some time to change, but that confidence in the economy, from investors and from citizens, will eventually even things out. That day, Zimbabweans agree, can’t come soon enough.